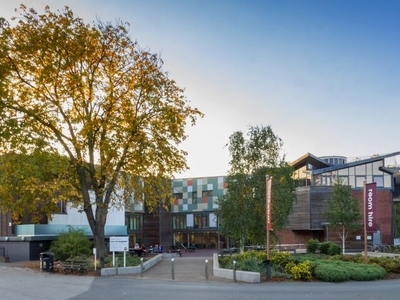 We have a variety of modern, accessible facilities and a range of spaces with views across Cannon Hill Park for your guests to enjoy. From smaller meeting rooms or breakout spaces in our Bryant Suite rooms to larger studio spaces, you’ll be sure to find the right space for you. If you’re looking for something different, our team can help to create a bespoke event for you too. Talk to us about creating an artistic experience for your team; get messy in our pottery studio or unwind with a yoga or Tai Chi class. You really are the dream team. You did everything we asked for so quickly, with such patience and skill. The attention to detail, customer service and responsiveness were second to none and we have only received positive feedback about MAC as a venue. For a quick look at the spaces we recommend for conferences and meetings, see the table below. This spacious dance studio doubles as an ideal venue for a conference or large meeting, hosting up to eighty people in a conference or cabaret style. Capacity: 0-120. Ideal for meetings and events, the Randle Room is large, airy and spacious, and certain to make your event special. Capacity: 0-90. ​Pinsent Masons Room 2 is perfect as a breakout space for events in Pinsent Masons Room 1 or the nearby Theatre. This room is fully equipped, spacious and multi functional. Also ideal for small boardroom meetings or sit down dinners. Capacity: 0-30. 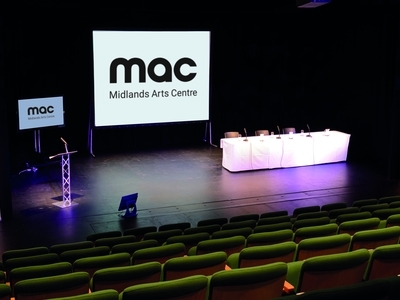 Recently upgraded, the Theatre comes equipped with the latest in lighting and sound technology, two large dressing rooms and a rear entrance for loading, making it an ideal venue for a large conference. Capacity: 0-219. ​The Deloitte Room is a versatile, ground floor space. 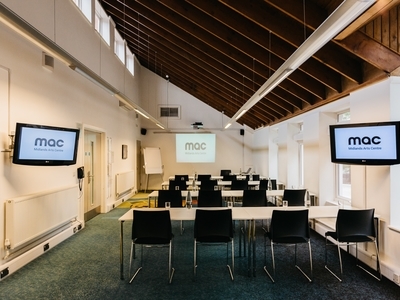 The room’s generous proportions make it great for conferences, workshops, training and hospitality events. Capacity: 0-85. This large, bright, and airy space is a fantastic venue for a theatre style conferences, lectures and board meetings. The room is fully equipped with projector, wireless internet and large sound system. Capacity: 0-66. We have a busy film programme full of wonderful screenings, but this space can also provide a great meeting and conference solution, with excellent day and half day rates. Capacity: 0-150. For smaller meetings or as a breakout area, the Roughley Room is ideal. As with each of the four rooms which comprise the Bryant Suite, the beautiful 1960s design and magnificent setting make it an extremely appealing venue. Capacity: 0-16. The Cole Room is ideal for all those one-to-one meetings outside of the office, and can be hired on an hourly basis. With a capacity of up to 12 people, this is a very flexible space which can be used for a variety of purposes. Capacity: 0-16. One of the four rooms which make up the Bryant Suite, the Saintbury Room is an intimate space is perfect for small meetings, with its unusual triangular formation. Capacity: 0-16. The largest of the four rooms which make up the Bryant Suite, the spacious interior and quiet location of the Bryant Room have made it a firm favourite with our clients. Capacity: 0-30.